Whey protein is a naturally complete protein that provides essential and non essential amino acids to support healing, muscle building, muscle and tissue recovery, energy and the immune system. Whey protein is a great source of branched chain amino acids for muscle support, precursors for glutathione production as well as alpha-lactalbumin and immunoglobulins for immune system support. Branched Chain Amino Acids benefit muscle metabolism and provide energy directly to muscle tissue. * The body requires higher amounts of branched chain amino acids during and following exercise as they are taken up directly by the skeletal muscles versus first being metabolized through the liver, like other amino acids. Low BCAA levels contribute to fatigue and they should be replaced in one hour or less following exercise or participation in a competitive event. One serving provides 21 grams or 80% high quality protein. It’s a delicious, low calorie, low fat, low carbohydrate drink mix supplement that is sugar free! The Best Whey is a great addition to any weight management program, not as a meal replacement, but as a source of energy and to curb appetite. Many find their appetite at mealtime is reduced when they use The Best Whey as a mid-morning or midafternoon snack. Whey protein naturally contains precursors for glutathione production. Glutathione helps defend the body against free radicals that can challenge or weaken the immune system. Natural protein fractions such as alpha-lactalbumin and immunoglobulins help strengthen the immune system. 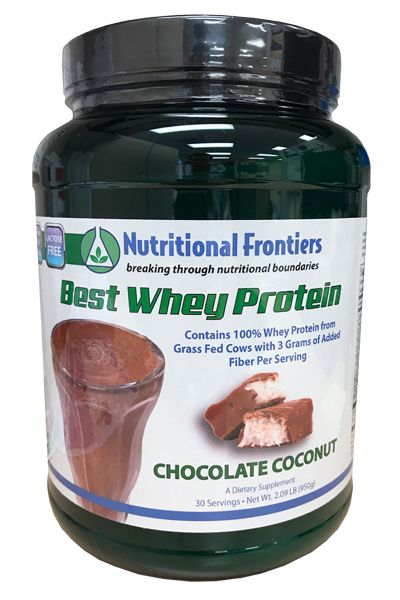 Other Ingredients: non GMO Whey Protein Concentrate, Fibersol- 2™, Cocoa Powder, Natural Flavors, Xanthan Gum, and Stevia. ***Typical amino acid and protein values are an average representation of samples taken across the manufacturing process. Allergen Statement: Contains Milk and Soy (lecithin). Manufactured in a plant that also processes peanut, egg, wheat, and tree nuts. Suggested Use: As a dietary supplement, mix one scoop (31.6g) daily in 6-8 ounces of water, milk, milk substitute or your favorite beverage, or use as directed by your healthcare practitioner. For best results, serve cold and use a shaker bottle or blender.